alaTest has collected and analyzed 167 reviews of Panasonic HC-V10 HD ready. The average rating for this product is 3.6/5, compared to an average rating of 4.0/5 for other Camcorders for all reviews. People are impressed by the size and portability. The price and zoom also get good feedback. The viewfinder and reliability get negative reviews, while there are some mixed reviews about the image quality. We analyzed user and expert ratings, product age and more factors. 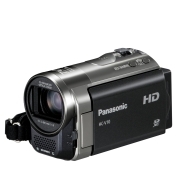 Compared to other Camcorders the Panasonic HC-V10 HD ready is awarded an overall alaScore™ of 81/100 = Very good quality. alaTest has collected and analyzed 45 user reviews of Panasonic HC-V10 HD ready from Amazon.co.uk. The average user rating for this product is 4.4/5, compared to an average user rating of 4.0/5 for other Camcorders on Amazon.co.uk. People really like the portability and size. The zoom and price also get good comments. alaTest has collected and analyzed 87 user reviews of Panasonic HC-V10 HD ready from Amazon.com. The average user rating for this product is 3.4/5, compared to an average user rating of 3.9/5 for other Camcorders on Amazon.com. Reviewers are impressed by the size and price. The portability and zoom also get good feedback. Many are less positive about the design and viewfinder. Very light and easy to use. Picture is very good. You lose stability when zooming in but that is the same with any camcorder unless you use a tripod.